Q. Do I need to book a table? Q. How can I find out what’s happening at Tallis? Q. Is smoking permitted at Tallis? A. Sorry NO … Tallis Wine is a smoke free zone, which means there is no smoking anywhere on the property. Burning butts can easily become a bushfire from just one ember, health regulations forbid smoking around food and smoking ruins the taste of wine. Q. Can I BYO my own drinks? A. Unfortunately No. Liquor licensing laws prevent the BYO alcohol onto the premises and in the name of good sportsmanship please don’t bring any BYO beverages. We have a range of beer and soft drinks available. Q. Is it possible to bring my own cake to Tallis? Q. Is it ok to bring a picnic to Tallis? A. We wouldn’t come and have a picnic in your backyard without asking so please don’t bring one to ours. This is a small business employing lots of staff and if we allowed BYO picnics we wouldn’t be able to pay them properly! There is a beautiful public park in the Dookie township which is perfect for a picnic. Q. When is the Rock Correa walking track open? A. Open Tuesday to Thursday: 11-3pm. Friday to Sunday: 11-4pm during cellar door hours. Closed Monday & Public Holidays. Front gates are locked at closing - 4pm Tuesday to Thursday and 5pm Friday to Saturday. Please make sure you are back from your walk by these times. Q. Should we check in before walking the track? A. For your safety if you wish to use the walking track please check in at cellar door first. The walk is on private property and a working farm so please stick to the track and read and follow the safety sign at the start. Q. When did your wine journey begin? A. The Tallis family has been part of the Dookie district for several generations; we planted our first vines in 1997 and now have 60 acres in our vineyard. Richard & Alice Tallis are committed to producing 100% estate grown wine reflecting the unique Dookie ‘terroir’, warm climate and distinctive ancient red hills. Q. What else is grown on your farm? 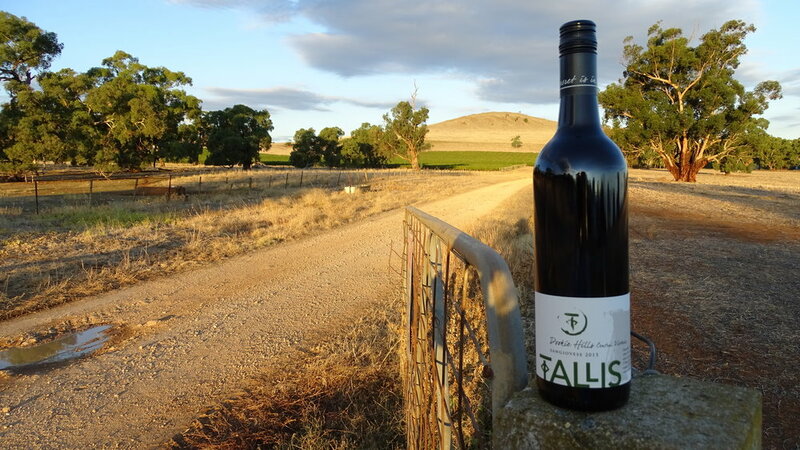 A. Tallis Wine is run alongside traditional farming enterprises including wheat, canola and sheep. We enjoy living and working on our property, closely monitoring the development of our vines, grapes and wine and it is extremely satisfying to oversee the whole process from vineyard to table. Q. Is this the first time vines have been planted? A. No. In the late 1800s Dookie flourished with expansive vineyards and at its peak produced one-third of Victoria's wine. Annual wine balls were held on the Tallis property in a vast and still undiscovered, cellar buried beneath the Dookie Hills. Unfortunately in the early 1900’s during the ‘grape glut’, government offered farmer’s subsidies to plant wheat and subsequently the Dookie vineyards were removed. Q. Where is the vineyard? A. Our vineyard can be seen in the distance over the paddock and across the hill from the cellar door. We chose the cellar door location because it has the best views on the property. Whatever time of year you visit, the landscape is spectacularly different. Q. Where is the wine made? A. Richard Tallis handcrafts our reds on the property in a small converted stable and because we don’t have cooling facilities our whites are made in collaboration with Victor Nash at Fowles Wine Avenel. We pick our grapes using a combination of hand and machine pick depending on the season, which are then crushed and fermented in open vats, hand plunged and then aged in a selection of new and old French and American barrels. Q. What is your philosophy around growing and making wine? A. We are committed to a low input sustainable system. Our viticultural practices demonstrate our respect for the environment and our philosophy of encouraging bio-diversity in the vineyard extends to the minimal use of additives in the winemaking process. To avoid using large air-conditioning systems our wine is stored in a purpose built environmentally sound straw bale barrel hall, which Richard Tallis built using bales grown on the property.